In a small pan set over low-medium heat, toast the pepitas, stirring occasionally, until they start making popping sounds and are very lightly browned, about 3 to 4 minutes. Remove from heat. For the avocado dressing, in the jar of a blender, add 1/2 cup of water and the oil, lime juice, garlic, cilantro, dill, avocado, pepper, salt, mustard, and the toasted pepitas, and puree until completely smooth. 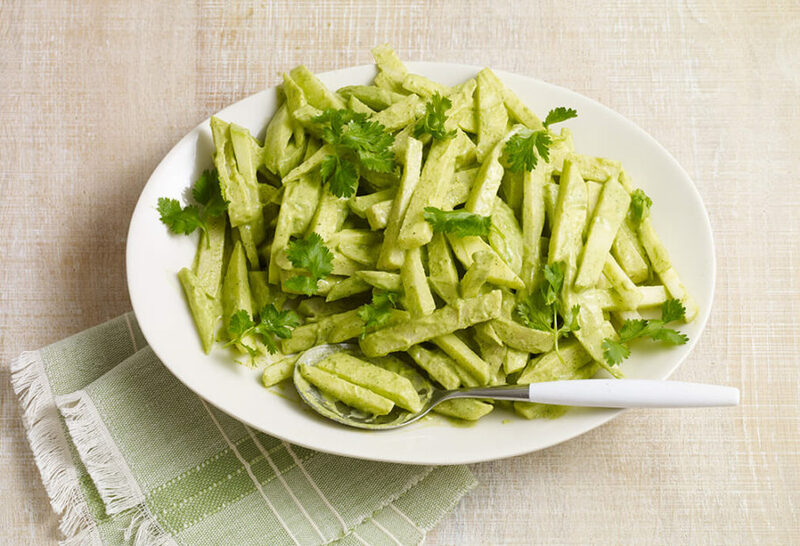 In a bowl, toss the julienned chayote squash, apple, and jícama with the avocado dressing. Garnish with some cilantro and dill and serve. Soy una fan muy grande , saludos a ti y a tu familia , Por un tiempo e estado buscando una receta que hicieste con tomatillo verde , manzana verde aguacate y mas ingredientes verdes ? Is the chayote raw? I’ve never heard of eating raw chayote. In many recipes chayote is cooked…but here they are raw and give a great crunch to this refreshing salad. I hope you enjoy it, Mary. I’m going to make this salad for my friends birthday. I was wondering if it would work if I put pomegranates in it? Can you make any part of the salad a day ahead? Give the pomegranates a try, Lili! And you can make the dressing ahead and toss it when you serve it. It will be good overnight in the fridge. I hope your friend has a great birthday! This. Was. Awesome. So simple, yet so tasty. It was the perfect accompaniment to the chili we made to entertain some friends. Thank you, now I don’t have to wonder what to have as a side with a bowl of red! Oh I’m so happy to hear it will be your go to side dish for chile, Pat. Pati, this was DELICIOUS !! I have a question to ask you though. How do I know or how can I tell if the jicama is ripe ? I had to cut away almost half of the one I bought to get to the softer inside. Thanks in advance. Love your TV show. Thanks Pati, I can’t wait to make this again. I added some chopped dried Cranberries ( Crasins ) to the mix along with extra Pepitas ( Pumpkin Seeds ) as part of the garnish…It was SUPERB Pati…Thank You!!! So glad you enjoyed the recipe and made it your own, D.! That jicama salad looked so delicious i am going to make it. Wow!! This was amazing. The explosion of flavor in the dressing. The crunchy vegetables. I could not wait to bring this to a summer pot luck. And when I did everyone loved it. I live in Long Beach, CA so the ingredients all are readily available and we have a large old avocado tree in the backyard for our own avocados. I make a lot of your recipes and always appreciate the authenticity of the delicious flavor. But this one I had to comment on. Superb. Yay! I’m so glad you enjoy lots of my recipes and especially this one, Jordan. I made the dressing and put it on some grilled halibut for a dinner party in the backyard for fourth of July. Outstanding! My name is Max and we watch your show here in Canada although no with my wife Iza. We wanted to try this salad the day we saw it on your show and in fact, we picked up the ingredients already. However, we came up short on the Jicama. Just wondering if there is a substitute. We actually bought a couple of turnips instead. We never had them either but wanted to see if they would work with this combo of green apple and chayote (sorprisingly no problem finding that). We have gone to several grocery stores but no luck. Any suggestions would be appreciated. Love your show! I’m so happy reading this…thank you Laura! I am one of your fans from the Philippines! May I know what veggie I can use in place of avocado? I recommend that if you can’t find avocados you might want to try another salad https://patijinich.com/category/recipes/salads/, or you can also try another vinaigrette, such as the Every Day Green Salad vinaigrette, for this same Chayote, Apple and Jicama salad. I’ve made this recipe twice now and my daughter loves, loves, loves it! Thank you. Yay! So happy your daughter loves it. What was a curious salad became a wonderful surprise ! Light , crisp and refreshing. And the cresmy dressing uniquely complements the dish perfectly . I highly recommend it. I have wanted to try this since I had watched the episode.Have to add a couple thing to the grocery list first it appears. I take care of the kitchen now and making some changes so will be trying more of your recipes. Thanks so much! Hope you love it Jay! OMG! This is amazing! Will definitely make this again! I was hoping to try this tonight but I forgot 2 of the main ingredients! Lol pepita’s & lemon! I know it says lime but I’m pretty sure u used lemon on the show & I prefer it ? Sooo, I shall try again tomorrow! I have no doubt that it will be amazing! I have thought about it since I seen it yesterday! Thanks so much for sharing all that you do! I have been to the Yucatan twice & every time I watch your show, I’m ready to pack the house, critters, & the hubs to move far south of the border! Again, thanks for sharing! I love your show & seeing your beautiful family, JuJu is so funny! ?? Good luck with the salad tomorrow…it’s super easy and super delicious. I have to say ..I watched this episode and the next day made this awesome salad for my family I served it with my grilled chicken breast and we are in love ..thank you Pati !! You got me making this every weekend! ..Everything you have taught me to make has been the best !! I’m a real good cook now!! Thanks again girlfriend! ! Connie that made my day to hear that you are a great cook now! Keep cooking and having fun in the kitchen! Made this salad for dinner with grilled steaks…we LOVE it!! So light and delicious, my husband says he wants to eat it all summer! Your show and recipes keep me in touch with my Mexican side…gracias Pati! Que rico!! It’s the perfect summer dish….I’m so happy that the show helps you keep in touch with your Mexican side. That means so much to me! Hola Greg, I’m so happy you were able to find a substitute and make the salad your own. I tried this and Oh Dios mio! Nos encanto Pati gracias por compartir sus recetas tan deliciosas! Mis hijos y yo no nos perdemos su show. Es un orgullo ver que comparte su recetas mexicanas con todos. Muchas gracias Yvonne (y tus hijos)! I’m preparing a dinner for new parents. Will these ingredients turn brown before they eat it? What a lovely gesture Kelly! The dressing should prevent it from turning too brown. Patti I enjoy your show on PBS, because not only we learn about Mexico, but we get to know your tasty recipes. Thank you Jenny! This means so much to me. Sorry Betty but we don’t track the nutritional data…but I’m glad you like the salad! You could always enter the ingredients in a number of Health / Diet Apps on your phone and it will show you all the nutritional data you need.